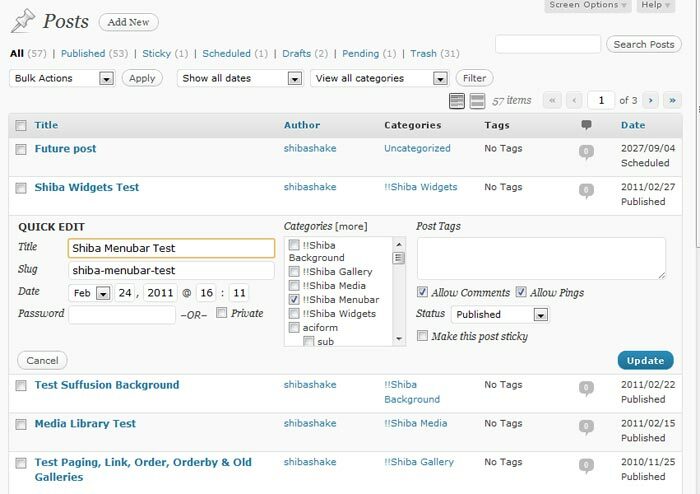 WordPress Quick Edit menu for Post objects. The first step towards expanding our WordPress Quick Edit Menu is to add a custom column to our target Edit Screen. In this example tutorial, we will expand the Quick Edit menu for Post objects. 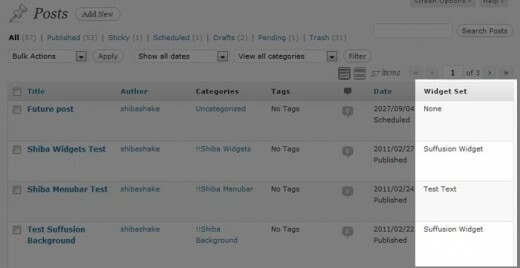 Therefore, we start by adding a custom column to our Posts screen. We add a custom column called Widget Set which shows some custom meta data associated with our Post objects. The code above adds a new but empty column to our Posts screen. Add new column for our Posts screen. 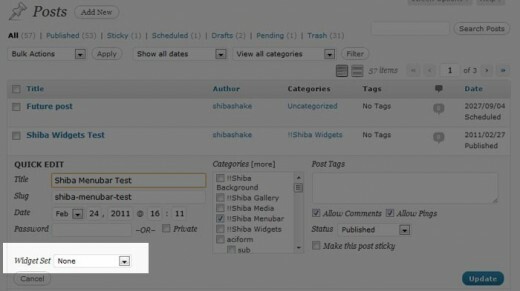 To fill our new column with the relevant meta-data values, we use the manage_posts_custom_column action hook. Line 2 – Add the manage_posts_custom_column action hook to our admin_init function. Lines 5 to 6 – Check for our new custom column. Lines 8 to 13 – Render our custom Post object meta-data values. Fill custom column with relevant Post object meta-data values. Now, our new column is filled with the relevant meta-data values. After adding our custom column, we are ready to expand our Post Quick Edit menu using the quick_edit_custom_box action hook. Note – The quick_edit_custom_box action hook will not fire unless there are custom columns present. That is why we started by adding a custom column. Line 5 – Only render our Quick Edit extension on the relevant screen. Lines 7 to 25 – Render our custom drop-down menu for selecting widget sets. Added a 'Widget Set' custom input to the Quick Edit menu. We save our new quick edit menu data in the same way that we save new custom meta-box data – through the save_post action hook. The save_post function below was adapted from the example found on WordPress.org. Now comes the really fun part – notice that while our new custom input shows up in the Quick Edit menu, it is not properly updated to show which ‘widget_set‘ the current Post object is set to. I.e., our widget set meta-data is not getting through to our custom Quick Edit menu. Line 13 – Make sure that Quick Edit menu is closed. The revert function (defined in inline-edit-post.js) ensures that our Quick Edit custom inputs are properly updated when we switch Post objects. Lines 15 to 16 – Set nonce value for our custom inputs. If we want, we can expand our save_post function to do a nonce check. Lines 18 to 22 – Set the proper widget set option on our custom Quick Edit drop-down menu. We do this by hooking into the post_row_actions filter. Post object link actions are originally defined in the WP_Posts_List_Table class. Lines 5 to 6 – Only expand Quick Edit links for the Posts screen. Lines 8 to 9 – Get nonce and other custom input values associated with the current post. inline_edit – Renders the HTML Quick Edit menu form. How to expand our WordPress comments quick edit menu with new custom fields, and properly save user-input values. Thanks for this tutorial. Does someone knows if this still work with wordpress 5.03 and 5.1. Hello, is this still working for you in WP 4.7.2? For me, it doesn’t work correctly. Post meta is added to the quick edit and also saved, but if I then click again on the quick edit link, there is no value. If it works on your blogs it must be my fault 😛 But maybe it is an incompatibility issue. But when saving metadata and clicking at the quick edit link the old value is shown in the quick edit field. Only after refreshing the page you can see the updated value. Is there a way to update the values immediately after clicking “Update” (like when I change the status of a post for example)? Thank you SO much for this very clear tutorial! Still works great (I’m using WP 4.4.2) and it was easy to follow along and modify to fit my particular custom field to be added. I am very glad. Thank you Trisha. Hi, i read this post..its nice..but ..i have a custom field “Download Link” i want to show this in quick edit mode how i can do this..
but i have a question … Is it possible that change custome feild data in in line edit in wordpress panel and how add this form …!!!? Followed your tut line by line and adapted to my needs (adding a custom column with each linked Mailpress draft’s title). Everything worked like a charm! Thanks a ton, mainly because I feel I’ve learned a lot while reading your code, editing it and debugging my mistakes. That’s unvaluable. Sorry, I “feel” it will work. But it does´nt. It is the POST_TYPE. But I like to have a sidebar (widgets) selection. What is to do? This is a very long time away from your original comment, but did you ever work it out? I am stuck on the exact same thing four years on! I’m testing this article in my WP installation. The problem is “Show this text” is printing two times. This is a problem because I’m trying to insert data in my database and I’m getting duplicates. Is there a way to have only one “Show this” text? I need insert checkboxes, in the dropdown only I choose a option, but in the checkboxes, I can choose multiple options . How can I do the change? Examples for several input types would be amazing. I tried to get this with just a simple text field and it took quite a bit. Also I have no idea how to get the JS part working, its very deep. Thanks for this TUT! Hey, thanks for the walkthrough. Really helpful, fantastic research. One thing… any idea how it’s possible to add the quickedit box to a different column? At the moment it just dumps it at the end of the quickedit html and sits below everything else. The entire quick edit menu is rendered in the inline_edit function. I did a quick scan through the function and didn’t see any obvious way to flexibly change the quickedit menu structure through hooks. 1. Add in empty fieldset cells to skip columns. If you want to prepopulate your field with jQuery it’s much simpler. Just inclue this script after your fieldset. remove after i click on update button. Thanks so much – I’ve got further with this than any other tutorial and think I will get it working, but I really need it for pages and custom post types more than standard posts. Could you tell me which fields I should be looking to update for this to work. Also, would I need to add this code to my functions file 3 times if I wanted it to work for 3 types of post? Sorry for complete idiocy, but this is such a great function I really want to understand it! why are you printing post title instead of custom field value? this line should print custom field value, isn’t it? and this code isn’t work, it’s return NULL though there is a value and it’s print the default value ‘NONE’. But if i set the default value to print $widget_id (line 13) it’s gone right, but the rest (that haven’t a value in the custom field) didn’t print anything. a little help and explanation would be appreciated. In the example, widget_set is my own custom post type. You would of course modify it to use whatever object or meta_data that is relevant in your situation. Hey, awesome post, but you got me a little confused now with the custom post type. So, when using this with regular posts, should I replace every instance of ‘widget_set’ with ‘post’? And where would I put my own custom field ‘website_url’ in this case (which is just a plain old text field, by the way)? Thank you for clarifying for me! I have the same problem (however for post tags) as mentioned already that I would like to retrieve the present settings and mark them with selected=”selected”. Is there any way to get the present ID of the element in that particular row? I have to reply to my own comment. I managed to get this working. For taxonomy editing you need to call the JS inlineEditTax.revert(); Thanks again, saved me lots of work! Hi, your code is really magic but i’m not a php expert developer, is there a way to insert custom fields instead the ID post? I need to show the 3 custom field options into the “option” form. Very interesting work, I was wondering if there is a way to remove items from quick edit, for example the categories box? There is no easy way that I know of. Here is the inline_edit function for posts. There may be some place to hook into to stop certain input elements from rendering. option without creating columns? I did this by calling method but i could’t make it work since those values are not saving could you walk through it once please guide me to achieve this. as a heads up if you are using this on a hierarchical post type, then you must change post_row_actions to page_row_actions. got stuck on that for a while. and to touch back on my old comment about setting the thumbnail from the edit.php screen, i was able to accomplish this except that the new image wouldn’t fade in. i couldn’t find any way to hook onto the completion of the ajax save. still looking for the appropriate callback. I have to get the current post meta inside the function and update the data with conditions of new and existing data. But seems like get_post_meta is not working. I tried this: get_post_meta($post_id, ‘_vm’, TRUE) while there is some existing data with meta key _vm but. It outputs nothing. It works good on other function. I need quick help. Not sure why. It could be an issue with the wrong $post_id or that the meta key starts with an underscore. I would print out the $post_id to make sure it is the post that I want. If that is not the issue, I would try using a different meta key. Anyway, let us know what works out. Sorry for late reply. That doesn’t work. The post id and meta key is accurate. I tried printing them and also tried with some other meta before doing the comment. It looks like the get_post_meta function doesn’t work inside the function for me. If you have time you may try. I used same code and data to get the meta data on edit post page and other places and that works fine. Im trying to just add a new field in the pages edit menu so that it will just display the page file name eg left-handed-widgets.html. ultimatly I just want to export a list of the page file names my site has. but dont want it in xml. just want a text file or CSV. cant find a plugin to to this anywhere. Ijust need to record on a table each page file name and its inherant google page rank. So I can get a at the glance view of which pages need a bit of sculpting. does anyone know if there is a plugin that will do this. I could follow the instructions if didnt have to second guess while file is being edited. or is that just the arrogance of the person writing the tutorial “if your wanting to edit this code, then you should know what file we are using, else get lost” how much extra effort does it take to just put in a step that says ‘open wp-admin/edit-xyz.php’ . In general, you do not want to edit WordPress core files. The best ways to add in new functionality is through a child theme or through a plugin. Some people edit their current theme file for a short term solution. I can understand your frustration with WP programming, but striking out at others is perhaps not the best way to get questions answered. Great! I had been looking for this since a long time! I needed a way to set my custom fields without opening up the post edit screen, but couldn’t find one. 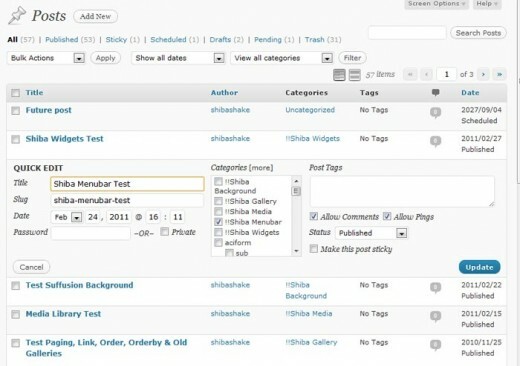 And then I came across this post when I was reading your http://shibashake.com/wordpress-theme/custom-post-type-permalinks post. nm. i must have messed something up while trying to expand it to my own purposes. sweet. thumbs up to Jan’s idea! i also have been wondering for a while if the thumbnail (added from your other tutorial) could be changed/set from the quick edit menu. I get these errors in the Firebug console when I use this code. Clicking the quick edit link doesn’t work when I use my copied and pasted version of the code. Where are you trying to add the quick edit expansion? What version of WP are you running? inlineEditPost should be defined in inline-edit-post.js (a native WP file) which automatically gets loaded in the Edit Post screen. Thank you so much for this tutorial! You are amazing. Do you know if this is possible for custom post types? You are my hero – the only person I could find that may have a chance at helping me! 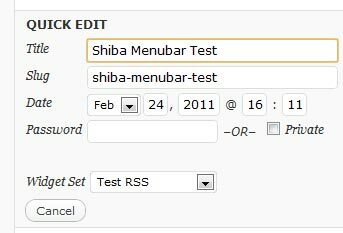 Is there any way you would take a paying job to help me create a column in my wp-admin post screen? I just installed the la petite URL plugin, and want the shortened URL’s to display on my main admin posts screen (for quick reference). I don’t need it in the quick edit function – just a column that displays the link/data. Please contact me at the email I put into the comment. Thanks! It should be much easier to add admin columns than to expand the quick edit menu. Thanks so much for this.. I can’t tell you how much help this was for me. With more appreciation than you could shake a stick at..
That is a good idea. I will add that to my to-do list. Thanks – You’re article helped a lot understanding and using quickedit.